Explore supply chain use cases (334 KB) What’s your potential ROI? 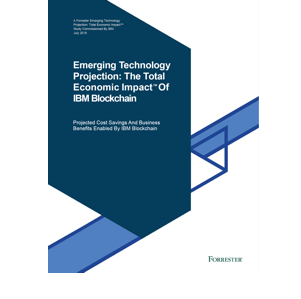 IBM Blockchain creates solutions that impact all facets of the supply chain, with a particular focus on logistics. Traceability and transparency are some of the most important foundations of logistics, and IBM Blockchain can optimize business transactions and trading relationships with robustly secure, global business networks. With solutions like TradeLens – the new, open and neutral blockchain-powered platform built to support global trade – major shipping and logistics players are benefitting from a shared ledger that’s updated and validated instantaneously with each network participant. The results are greater collaboration, streamlined inventory management, improved asset utilization and more. Replacing traditional processes with blockchain could help transform trade – and the world economy. To keep containerized freight shipments moving smoothly and predictably, you want the big picture and the details of every transaction at your fingertips. This industry advancement is delivered through TradeLens, the global supply chain platform designed to promote a more efficient, predictable and secure exchange of information. TradeLens is now available to all members of the shipping and logistics ecosystem. IBM Food Trust™ uses blockchain technology to create unprecedented visibility and accountability in the food supply chain, connecting growers, processors, distributors, and retailers through a permissioned, permanent and shared record of food system data. This comprehensive World Trade Organization study reports that blockchain is a technology that will change the lives of many, with potential uses well beyond the world of cryptocurrencies. Learn how Golden State Foods is working with their restaurant clients to ensure food quality with fresh thinking that combines blockchain, AI and IoT technologies. Supply chain leaders and the Enterprise Resource Planning systems they manage are driving their organizations and ecosystems to maximize the usefulness of data. Learn how to accelerate innovation and transform your supply chain with IBM Blockchain.